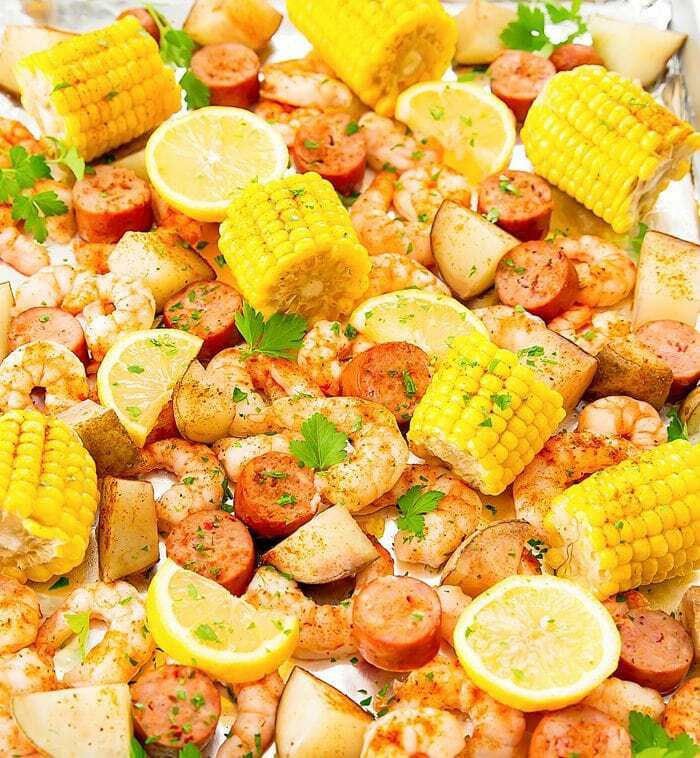 This easy shrimp boil is baked in the oven using one sheet pan and aluminum foil. It’s an easy meal with minimal clean-up. Recently, I had a craving for shrimp boil, even though it’s the middle of winter rather than summer. 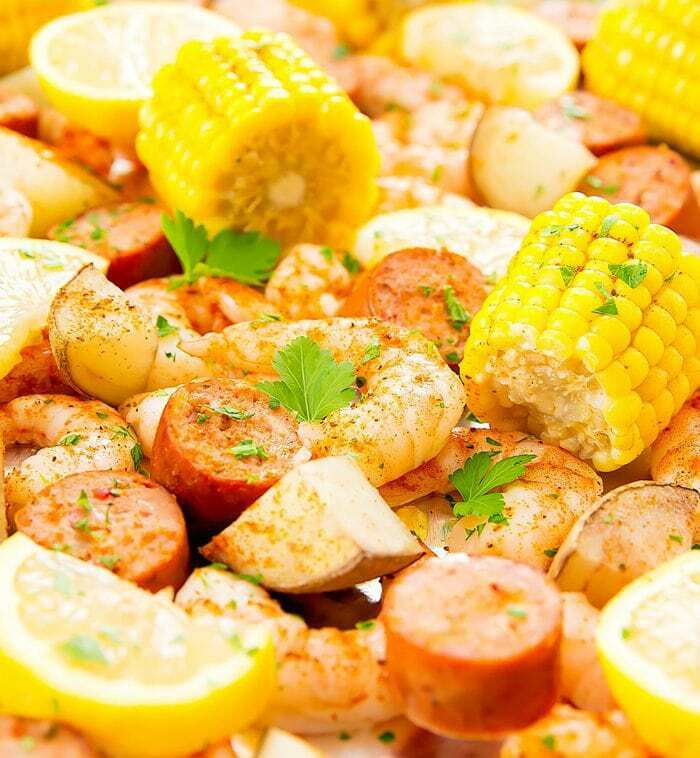 Traditional shrimp boil is made in a pot, but this oven method is so much easier to clean-up. 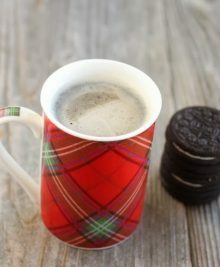 It did feel a little strange eating this for dinner while wearing sweaters and wool socks, but it was still delicious. For me, the best part of a shrimp boil is the andouille sausage. I could skip the potatoes. 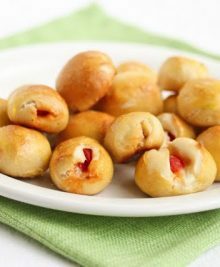 If you have to have potatoes, you do need an extra cooking step because the potatoes take longer to cook in the oven so you’ll have to cook them first. But you can make them on the same sheet pan so the clean-up is still minimal. 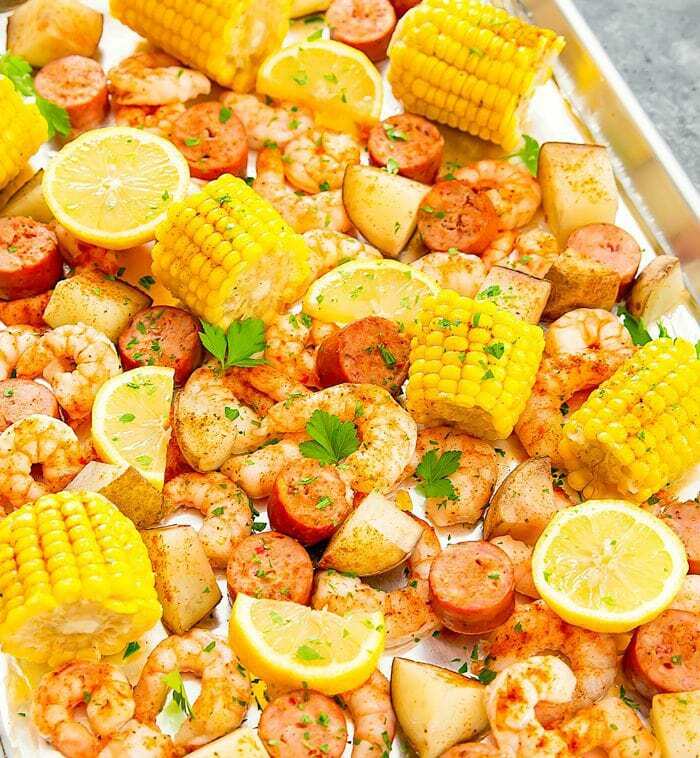 Shrimp boil is cooked in the oven on a single sheet pan sealed with aluminum foil for an easy meal with minimal clean-up. Preheat oven to 425°F. Line a large baking sheet (I used a two thirds sheet pan) with two sheets of foil. 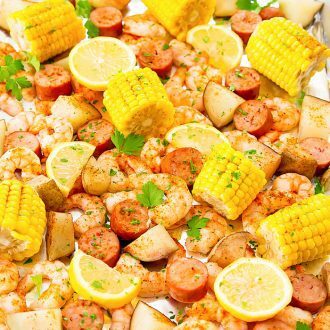 Add shrimp (if using frozen shrimp, make sure they are completely defrosted), andouille sausage, potatoes and corn to the sheet pan. Make sure everything is on the sheet pan with no overlap. Lightly drizzle surface of ingredients with 2 tbsp olive oil. Sprinkle Old Bay seasoning evenly across top, so that everything has a light layer of seasoning. Cover the pan with foil and seal with the bottom foil to make a large foil packet sealed on all four sides. Cook in the oven for 20-25 minutes, until shrimp and corn are cooked. Garnish with fresh parsley. Sprinkle with additional Old Bay seasoning if needed. Squeeze fresh lemon juice over shrimp boil before serving. Got to love sheet pan dinners! This dish is certainly a peek of sunshine in this cold, rainy Feb!! i love sheet pan dinners! Just made this today and it came out great. Easy clean up, too. Will be keeping this recipe for future use. Thanks! 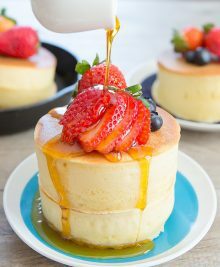 How would I best adjust this recipe to use with cooked frozen shrimp? I’d suggest defrosting the shrimp, seasoning them, but then hold off adding them to the pan until towards the end of cooking time. Hi! Is this still good reheated as leftovers? I’m looking to make it a 4-day meal prep.